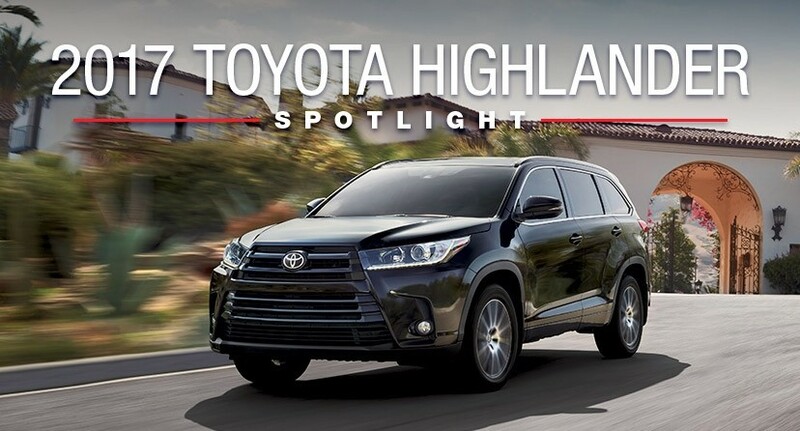 With a low-riding design, capable performance and an interior filled with great features and amenities, the 2017 Toyota Highlander offers families a ride that’s as comfortable and stylish as it is luxurious. Enjoy its versatile eight trim levels, with options like three hybrid trims and the choice between front- or all-wheel drive. The Toyota Highlander also offers great efficiency with a fuel rating of up to 24 mpg highway with the standard model or up to 30 mpg in the city with the hybrid powertrains. The 2017 Toyota Highlander is offered in eight trim levels: LE, LE Plus, XLE, SE, Limited, Hybrid LE, Hybrid XLE, and Hybrid Limited. Front-wheel drive (FWD) is standard on all non-hybrid trims, while all-wheel drive (AWD) is optional on all non-hybrid trims and standard on hybrid trims. **Hybrid torque figures not yet available. For the 2017 model year, the Toyota Highlander offers drivers everything from a bold and stylish exterior design to premium interior comforts that accommodate up to eight passengers. One of its number one priorities, however, is innovation. The 2017 Toyota Highlander delivers advanced technology, ranging from fun entertainment in the cabin to cutting-edge safety systems. The interior of the 2017 Highlander has a grand total of five USB ports, which allows the whole family to keep their devices charged and connected on the road. With an available rear-seat Blu-ray entertainment system, the kids will be able to watch their favorite movies on the go. To make things even better, the Entune ™ Multimedia Bundle provides you with access to music streaming, navigation, and helpful apps. The Toyota Highlander doesn’t mess around when it comes to safety technology. Some of the features include a rearview camera and a Blind Spot Monitor with Rear Cross-Traffic Alert. On top of that, the Toyota Safety Sense ™ P (TSS-P) package comes standard on the Highlander, with systems such as Lane Departure Alert with Steering Assist, a Pre-Collision System with Pedestrian Detection, and even Dynamic Radar Cruise Control that uses radar to automatically adjust to the speed of the vehicle in front of you. Visit our team at Lancaster Toyota to learn more about the 2017 Toyota Highlander and schedule a test drive today.